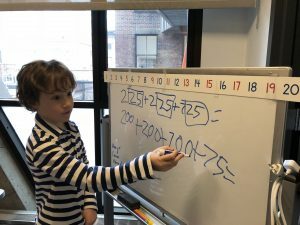 You’ve probably wondered why the math your child is doing at Gaynor doesn’t look like the math you did as a child. The simple explanation is your child’s math has been influenced by the success of the tiny country of Singapore whose students dominate international rankings for math and science according to the Trends in International Maths and Science Study (TIMSS). The framework of Singapore Math is developed around problem-solving with a well-researched concrete-pictorial-abstract approach to teaching math. Hands-on manipulatives allow students to experience the meaning of the math they are learning; pictorial representations provide additional understanding through visuals; and finally the experience is expressed in abstract numbers and symbols. Since our place value system is the foundation of our number system, students learn to decompose numbers according to place value. Once students truly understand the value of a number and can decompose it into parts in a variety of ways in order to solve the problem, then they are able to understand why algorithms work and that understanding is more effective than memorizing rules. 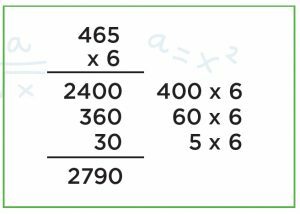 Student is decomposing 225, 225, and 725 into 200 and 25, 200 and 25, and 700 and 25. Then he can add 200 + 200 + 700 + 75 to reach the total of 1175. The number 65 is decomposed into its place value parts in order to create more simple arithmetic. Students’ ability to think about the numbers and develop thinking skills is more important than learning rote calculations. The concept of metacognition (the ability to think about how you are thinking) is closely tied to the framework of Singapore Math. Learning alternative ways to approach math problems allows students to think critically about why the math works. The next time you see your child solving math problems in ways that make you wonder what they are doing, know that they are using the number system as a platform to develop great thinking skills!